I think this is the first time I'm doing a blazer over dress look. I usually don't like doing that because it seems I'm hiding the beauty of the entire dress. But today, it's out of necessity. It's a fairly old dress which is now a little tight in the chest area. Wearing a blazer is always a good way to cover any imperfection. It might be out of necessity, but this is a great look. I love the blazer with this print. You look really nice! What a great first try! You look chic, and profesh! I do love me a blazer. I think you can still see the beauty of this dress! Is that snow I see in the background??! You can never go wrong with this look - a blazer can put anything together. you look great in that color green! Very chic! I like that color on you. 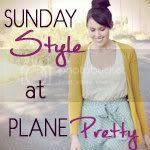 Blog hopping - love this look on you. The blazer makes the dress look so sophisticated! Love the print on it! I particularly like this print. Blazers over dresses are classic combos, but they work especially well with a clean, modern-looking print. You're so right ... a blazer can hide a multitude of sins. Looking pretty for the New Year, yound lady! I love blazers! And it's a good way to change up a look and if your feelin chilly!